A personalized jeremiad against the state of constant distraction in which our benevolent technologies have ensnared us. 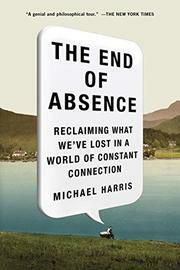 Toronto-based journalist Harris argues that our full-time engagement with the Internet, smartphones and social media has robbed us of “absence”—the ability to withdraw from life’s dissonant demands, whether for personal growth, intellectual accomplishment or simple serenity. The author begins by noting that all readers born before 1985 are experiencing a moment akin to the invention of printing, in that no other generation will again experience nondigital society. He notes that ever since Plato, the old have groused about younger generations’ adaptations of technology for its convenience. Yet he cites studies suggesting that digital technology may affect the plasticity of adolescents’ developing brains, arguing that without absence, “our children suffer as surely as kids with endless access to fast food do. The result is a digital native population that’s less well rounded than we know they could be.” Harris examines the many aspects of contemporary life that have been quickly transformed by this constant digital engagement, ranging from the relentless nature of online bullying to the transactional sexuality encouraged by “hookup” sites like Grindr. He even suggests that the notion of expertise itself has been destroyed by the open-source nature of Wikipedia. Harris supports his discussion by engaging the work of technology writers and philosophers, plus some behind-the-curtain interviews with social media CEOs and personalities like Generation X author Douglas Coupland. Finally, Harris chronicles his experiment called “Analog August,” when he disconnected from the Internet and his phone entirely: “I wanted to remember the absences that online life had replaced with constant content.” Harris’ core argument regarding the values of technological disengagement feels valid, and his prose is graceful, but as a social narrative, the book becomes repetitive and less focused as it proceeds. A thoughtful addition to the bookshelf addressing the unintended consequences of a wired world.